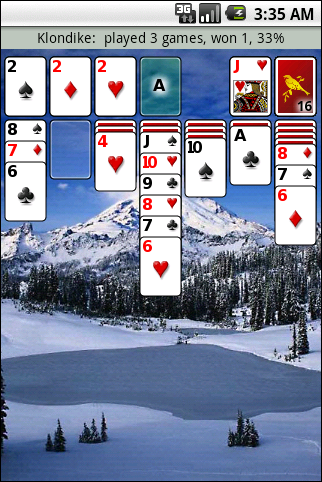 Patience Revisited is a collection of solitaire card games developed for the Android phone. This carefully chosen selection includes old favorites, pleasant diversions, and games that exercise the mind. We have discovered so many delightful games, that we have made it our goal to bring them to you so that you can enjoy them too ! We hope you have as much fun playing Patience Revisited as we do. Also, we will add games on request! You can download a copy from Android Market in your Android phone. What is your favorite classic solitaire game?